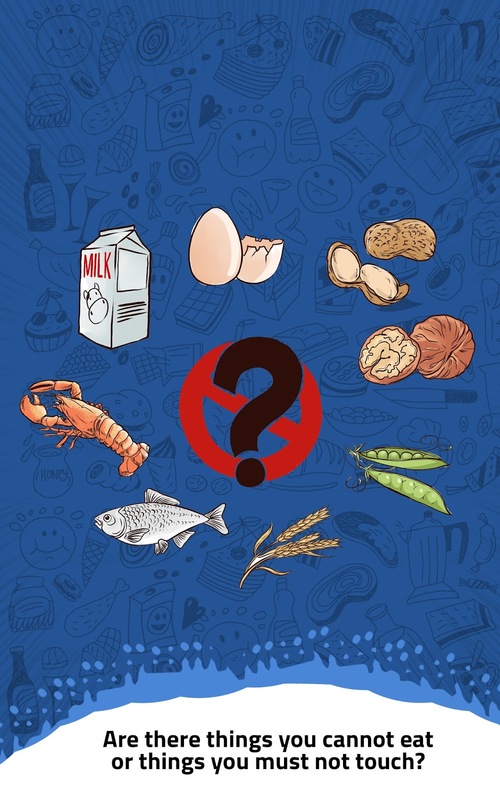 My Kids Food Allergies' website has great resources for allergy education, including great print outs, recipes, games and more. 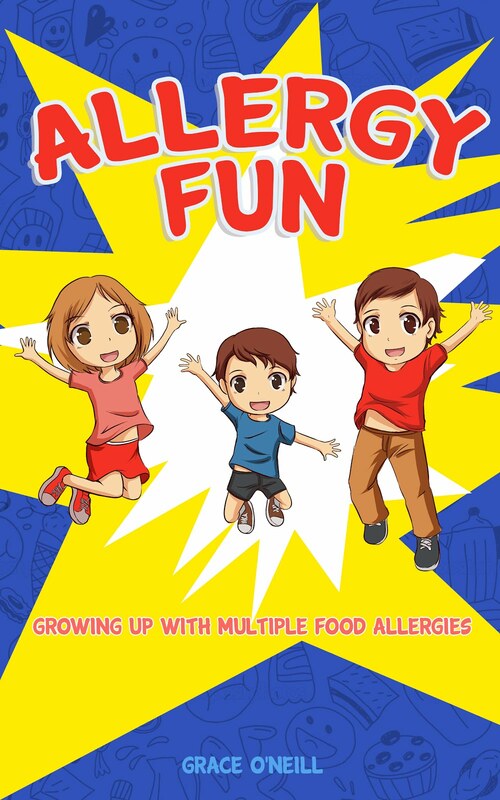 They have also just published a very comprehensive review of Allergy Fun - check out what they thought of our book and please feel free to SHARE the link. Thanks My Kids Food Allergies for the great work you do to help the allergy community. Order Now, or simply find out more. Starting School - questions to raise concerning food allergies. As parents of a child with multiple food anaphylaxis, everything we do has to be done with extra care and extra preparation. When our son started to attend childcare, there was already a lot of meetings and paperwork that needed to be organised in preparation. However, when starting big boy's school, the scene is quite different in a number of ways. At childcare, all the food was provided by the official cook. NO FOOD was allowed into any of the rooms. The Epipen we provided was moved from inside to outside, whenever the children went to play outdoors. If our boy moved rooms at the end of the day, his medications moved with him. The teacher/child ratios are such that no child is ever out of sight for any length of time. When I look back at this, it seems so cocooned... just the way I like it! And, I might say, for good reason. 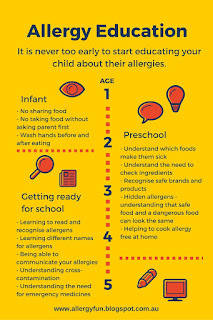 The children are so young, and although allergy education was emphasized, their level of understanding and level of self control is pretty much limited. At school, children bring their own food. Food can be eaten in the classroom, under supervision, or it can be eaten outside (with significantly less supervision). School has multiple teachers, in multiple rooms, over a much larger campus. The age gap amongst the children is much greater , so there is more potential for bullying and intimidation. It makes so much sense when we feel our anxiety levels rise. There is good reason. So here are some points to consider when getting ready to start school. Action Plans, Medicine packs, Emergency Procedures, Staff Training, Lunchtimes, School Layout, Yard Duty, Crafts, Treats, Labels, Allergy Education... and of course Bullying! Asthma Action Plan - If your child suffers from asthma, then the Asthma Action Plan is equally as important. Check with your school which Asthma plans they use, since they seem to vary slightly. Medication - Our medications include: Epipen (with good expiry), Ventolin, spacer plus mask (if needed), small bottle of antihistimine with plastic spoon.These medications need to be stored in an unlocked area that can be accessed readily. Emergency management - What happens if the child becomes sick in the playground. What staff are around? Do they carry phones? What happens if the child becomes sick in a classroom? If an allergic reaction is obvious, then it is likely that appropriate procedures are followed. What if a child simply has a sore tummy? Or vomits for no reason? Normally, a child is escorted by another child to the sick bay. 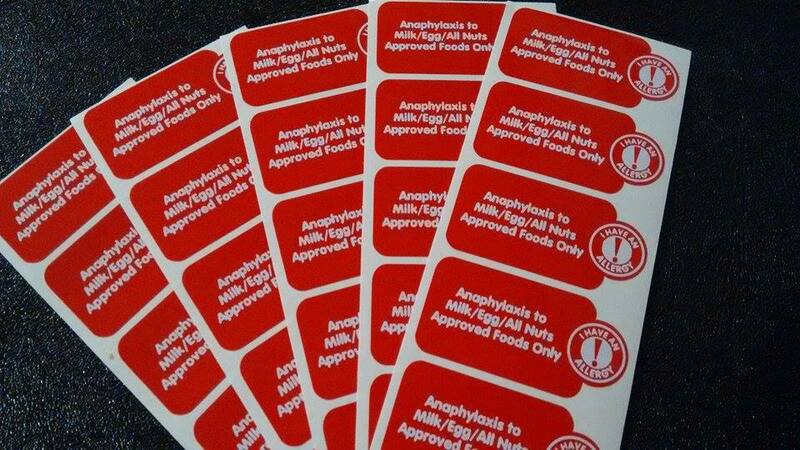 This is simply not appropriate for a child who may suffer anaphylaxis or an asthma attack along the way. Staff training - check that all staff have or will undergo Anaphylaxis First Aid training. Emphasize that First Aid training is for emergencies, and while it is vital, prevention is also paramount. 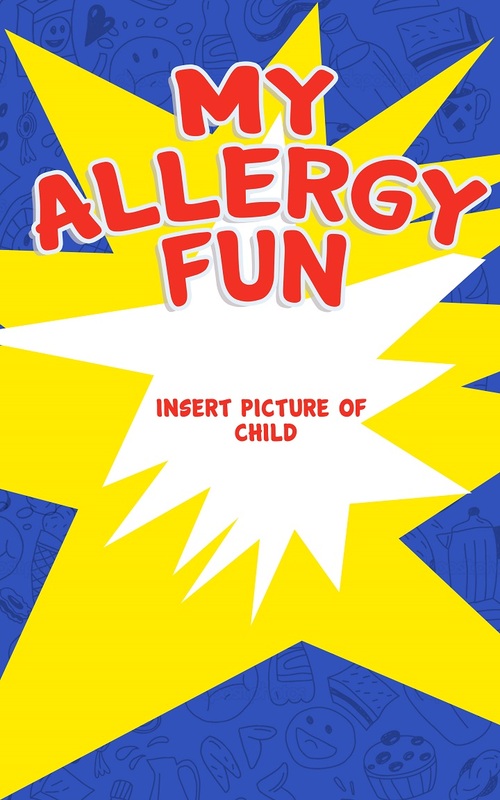 Will all staff be able to recognise your allergic child? What happens when substitute teachers are used - who will make them aware of your allergic child? What experience does the school have with anaphylaxis and other allergies? I like to take a look at their first aid room and talk to whoever is in charge of it. Lunchtimes/mealtimes - Does the school have a food policy of no sharing? Where do the children eat? Are they supervised? Does your child need to sit in a specific spot? Is there a handwashing policy BEFORE and AFTER eating? School Layout - this affects how many Epipens you feel is necessary. Not many schools will allow a young child to carry their own medications. There can be concern that it gets misplaced/damaged, or that it is accidentally activated. If the school is large, there may need to be more Epipens placed strategically around the grounds. 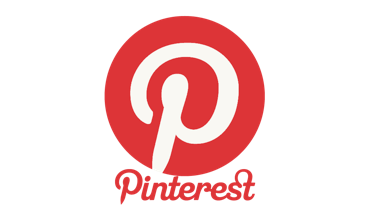 Discuss how this can be managed and accessed in an emergency. Yard Duty - with multiple food allergies, we simply stated that our son is not to pick up rubbish under any circumstances. He doesn't do cleaning if food is involved at all. Craft - allergens can be hiding anywhere when it comes to schools. Kids with Food Allergies provides a helpful list of products and activities to be aware of. For us, we decided the classroom is not to use any recycled food containers or boxes. 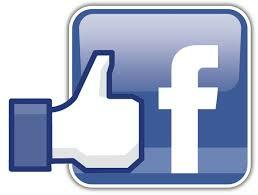 It will always be difficult to monitor the use of every product, in every situation. Older children especially, will be asked to complete projects at home that will then be displayed in a school for others to see. Explaining this to teachers is important, but teaching our child not to touch these displays is really important too. Treats - we supply a selection of sealed treats for our son, for situations where others have brought a cake to share for a birthday, or any other situation deemed appropriate by the teacher. I try and encourage the teacher to choose non-food related rewards like stickers or extra games/computer time, but unfortunately so much of our culture and society revolves around food, it is near impossible to avoid when dealing with over 20 children and their families. 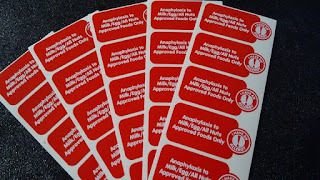 Labels - everything at school needs to be labelled, but perhaps consider making up stickers with an Allergy Alert. I put them on lunch containers, so that anybody walking past will see it, and be on alert. Bullying - the dreaded question. How does the school view food threats made towards an allergic child? What would be the process? Our school was adamant that this sort of behaviour had never happened before. Believe it or not, it's been nearly 2 years, and we actually have never had an issue. The general attitude and behaviour at our school means the children are always reminded to be caring, to be kind and to be respectful towards each other. However, the school can't control every child that enters it's gate, so it is worth understanding what the procedures are should the situation arise. Extra clothes - any small accident can mean a child needs a new set of clothes. If someone bumps into them and spills their food, this can be a cause for concern. I packed a spare set of clothes in a plastic bag with their name on it. This could be left with the class room teacher for the whole term. Our school has extra sets of clothes already, so this wasn't needed.